The landmark rectangular towers have been saved from the fire that caused horrific damage. French President Emmanuel Macron has promised to rebuild Notre Dame Cathedral and says he is seeking international help to restore the Paris landmark. Macron said after the French capital's fire chief announced the emergency response had changed into a monitoring and mop-up operation, "The worst has been avoided although the battle is not yet totally won." Macron said a national fundraising campaign to restore Notre Dame would be launched Tuesday and he called on the world's "greatest talents" to help. 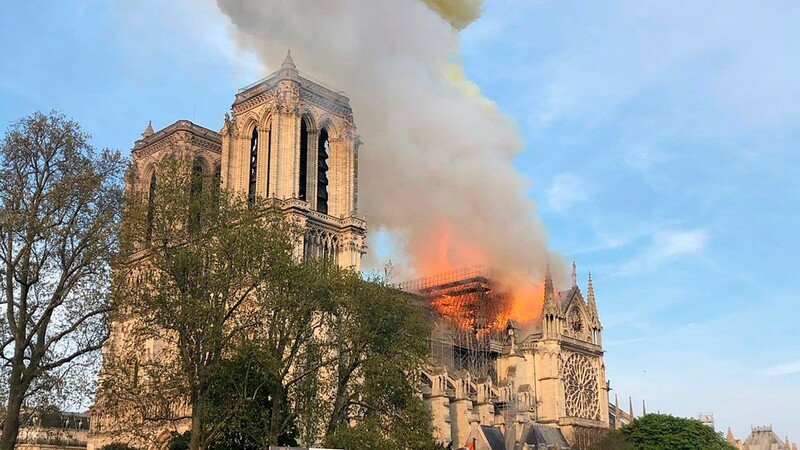 The French leader credited the "courage" and "great professionalism" of firefighters with sparing Notre Dame's facade and two landmark towers from being destroyed. 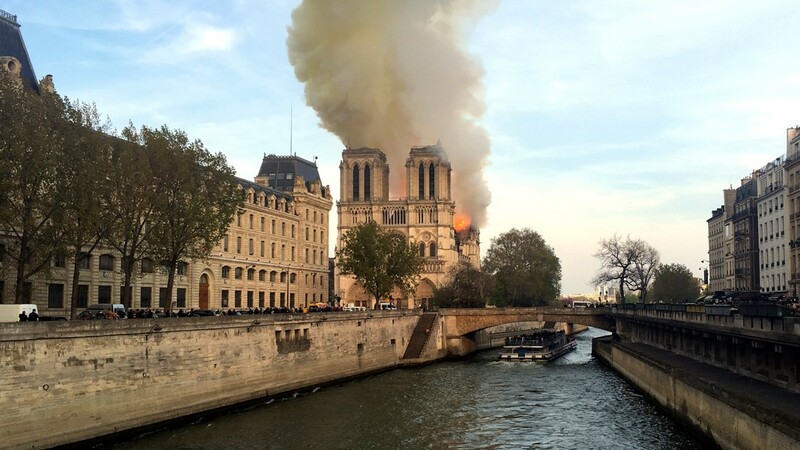 Paris fire commander Jean-Claude Gallet said a major accomplishment of hundreds of firefighters was stopping the flames from spreading to the north tower belfry. 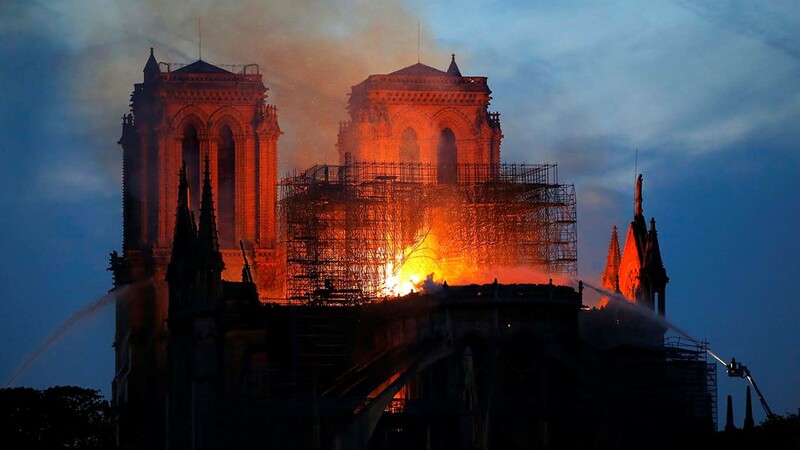 Gallet says two-thirds of Notre Dame's roofing "has been ravaged." He says one firefighter was injured. He says fire crews will keep working overnight to cool down the structure. 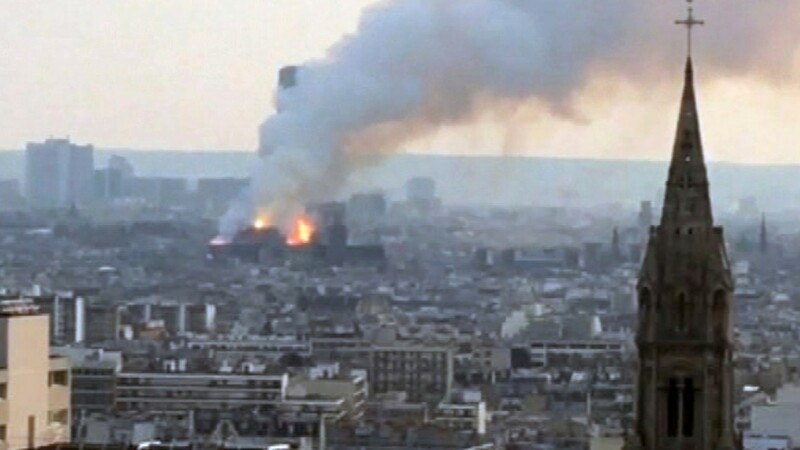 An official from the French Interior Ministry says 400 firefighters were at the scene. 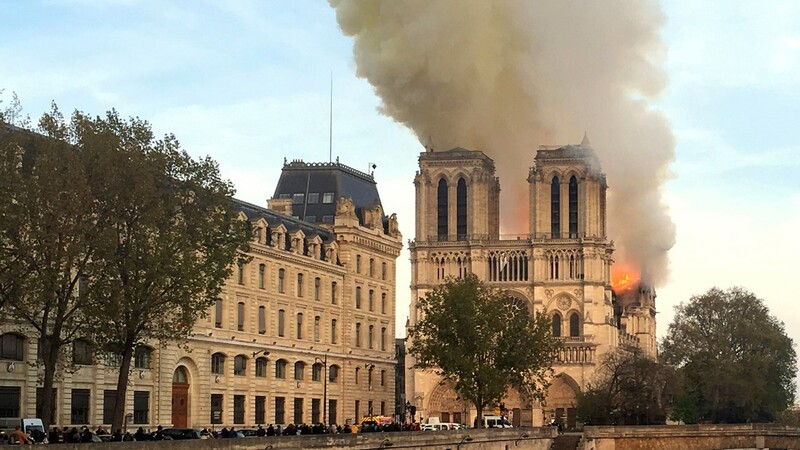 The mayor of Paris says people who live near Notre Dame Cathedral have been evacuated in preparation for the burning structure's possible collapse. 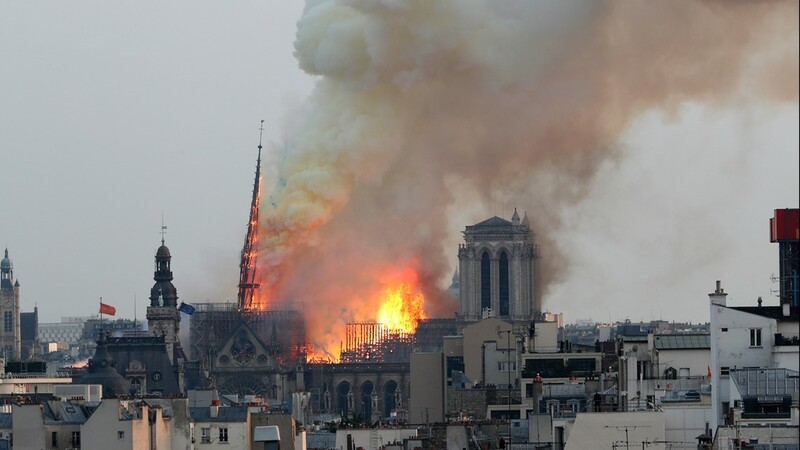 The cause of the catastrophic blaze was not known, but French media quoted the Paris fire brigade as saying the fire is "potentially linked" to a 6 million-euro ($6.8 million) renovation project on the church's spire and its 250 tons of lead. The Paris prosecutors' office says investigators are treating the blaze as an accident for now. The prosecutors' office said they have ruled out arson in Monday's fire, including possible terror-related motives for starting the blaze. Prosecutors say Paris police will conduct an investigation into "involuntary destruction caused by fire." Flames shot out of the roof behind the nave of the cathedral, among the most visited landmarks in the world. Hundreds of people lined up bridges around the island that houses the cathedral, watching in shock as acrid smoke rose in plumes. The fire came less than a week before Easter amid Holy Week commemorations. Macron was treating the fire as a national emergency, rushing to the scene and straight into meetings at the Paris police headquarters nearby. Paris deputy mayor Emmanuel Gregoire said emergency services are trying to salvage the famed art pieces stored in the cathedral. Built in the 12th and 13th centuries, Notre Dame is the most famous of the Gothic cathedrals of the Middle Ages as well as one of the most beloved structures in the world. Situated on the Ile de la Cite, an island in the Seine, the cathedral's architecture is famous for, among other things, its many gargoyles and its iconic flying buttresses. The cathedral was immortalized in Victor Hugo's "The Hunchback of Notre Dame," published in 1831, and has long been a subject of fascination in popular culture as well as the traditional art world. "It's been 800 years that the Cathedral watches over Paris", Pascal said. 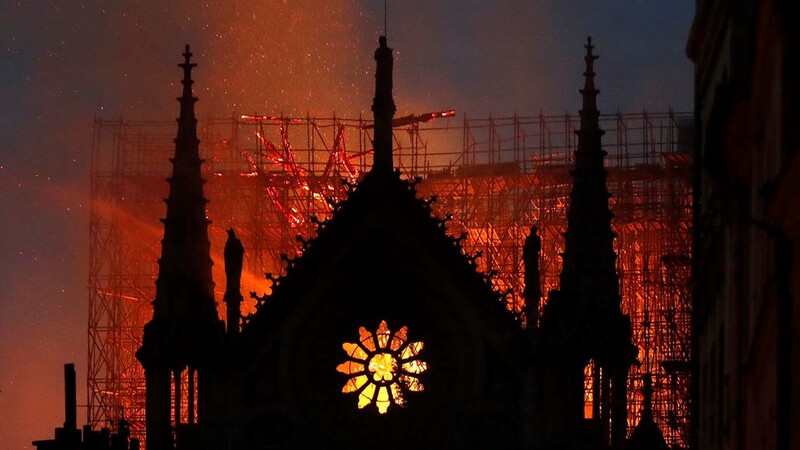 "Happy and unfortunate events for centuries have been marked by the bells of Notre Dame." 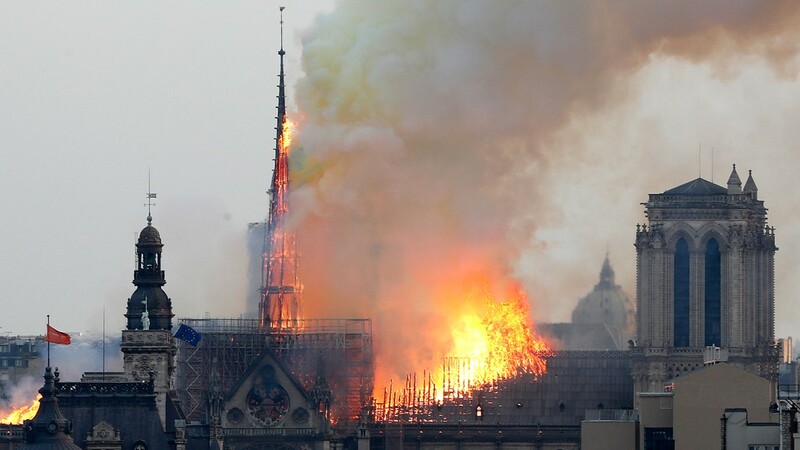 Associated Press reporters at the scene saw massive plumes of yellow brown smoke filling the air above the Cathedral and ash falling on the island that houses Notre Dame and marks the center of Paris. As the spire fell, the sky lit up orange. Paris Mayor Anne Hidalgo is in despair at the "terrible fire." 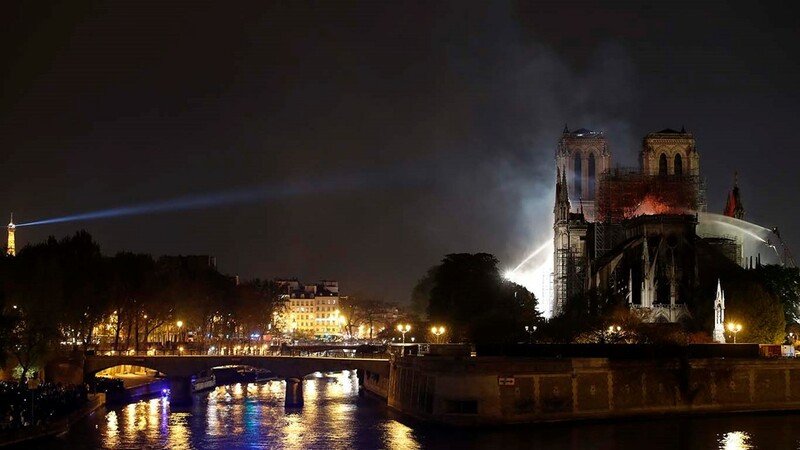 Hidalgo said in a Twitter message that Paris firefighters are still trying to limit the fire and urged Paris citizens to respect the security perimeter that has been set around the cathedral. Hidalgo said Paris authorities are in touch with Paris diocese. Reactions from around the world came swiftly. In Washington, President Donald Trump tweeted: "So horrible to watch the massive fire at Notre Dame Cathedral in Paris" and suggested first responders use "flying water tankers" to put it out. The president also made remarks at the beginning of an event about the economy in and tax reform in Minneapolis that the catastrophic blaze was a "terrible sight to behold." 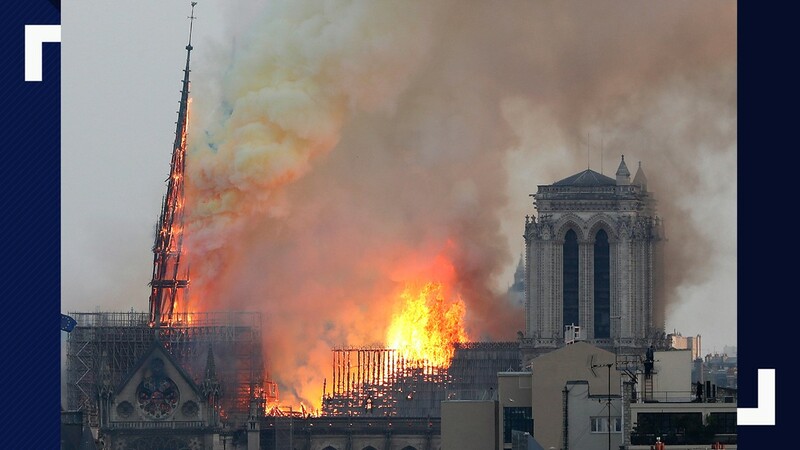 Describing the French cathedral as "one of the great treasures of the world," the president said the blaze looked like it was burning Notre Dame to the ground. Firefighters tackle the blaze as flames and smoke rise from Notre Dame cathedral as it burns in Paris, Monday, April 15, 2019. 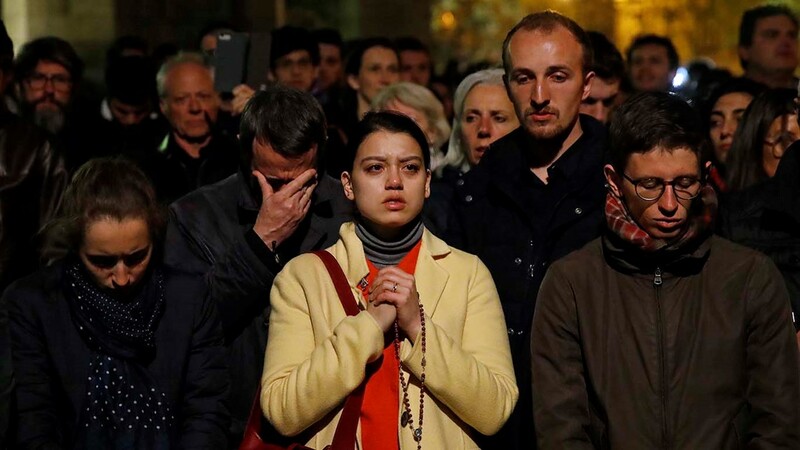 People pray as Notre Dame cathedral burns in Paris, Monday, April 15, 2019. The Eiffel Tower, left, is seen while Notre Dame cathedral is burning in Paris, Monday, April 15, 2019. Flames and smoke rise from Notre Dame cathedral as it burns in Paris, Monday, April 15, 2019. 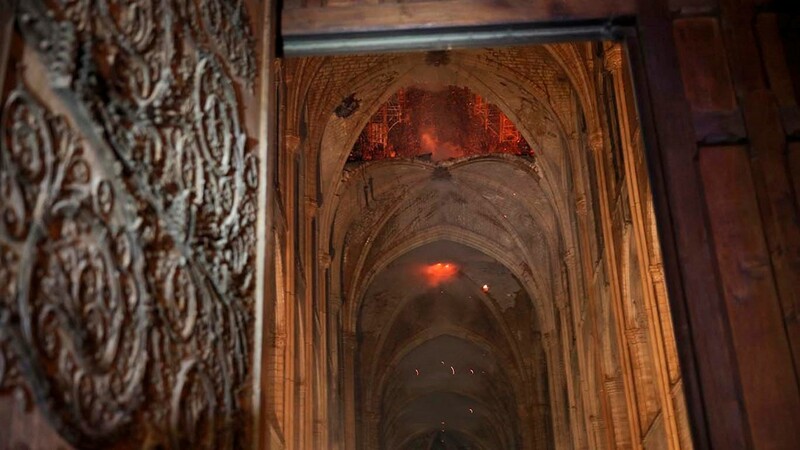 Smoke and flames are seen in the interior of Notre Dame cathedral in Paris, Monday, April 15, 2019. Associated Press writers Elaine Ganley and Sylvie Corbet contributed.